The Kirtipur Hospital is a communal hospital, run by the Nepalese Public Health Concern Trust (Phect Nepal) and Kirtipur Municipality. Currently, 100 beds are available. It is planned to have a maximum capacity of 300 beds. 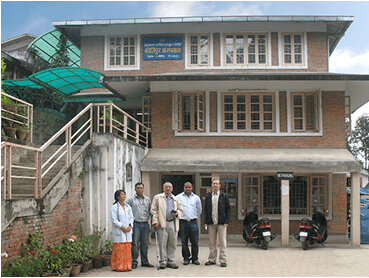 Supported by Kathmandu Model Hospital (KMH) Kirtipur Hospital has been in operation since 2006. Originally there was a dental treatment and an obstetrics department on site. Affiliated is the “Nepal Cleft and Burn Center” for the treatment of cleft lip and palate, also known as an approved burn care center. Here, internationally renowned specialists work together with the Nepalese doctors. There is the possibility to carry out skin donations for skin transplants. geographical location: Kirtipur is situated few miles Southwest of the Kathmandu city centre next to the Tribhuvan University Campus. Despite its proximity to the Capital one can find quiet rural life, wonderful traditional cottages and stunning temples in Kirtipur, which are remnants of the former significance of this town. Currently, there is a gynaecological station as well as a general medical station (mixed internal and surgical station). Furthermore, there is an IMC (Intermediate Care) as well as an ICU (intensive care unit). There are permanent Nepalese doctors in the field of general medicine, anaesthesia, gynaecology / obstetrics, ENT, internal medicine, surgery, paediatrics, radiology and urology, as well as house officer and medical students from Nepal, but also from other countries (e.g. from India, Pakistan, Australia, Germany, United States, Canada). In addition, doctors of the KMH are sent to Kirtipur on rotation. The complete range of general medical conditions is treated (tuberculosis, bronchitis, asthma, diarrhoea / cholera, gastritis, arthritis, cataract, vitamin deficiency, influenza, ulcer, AIDS, urinary tract infections, malaria, liver cirrhosis, Appendectomy, cholecystectomy) and all kind of surgery. In addition, an endoscopic department is being built with the help of Nepalmed, in which gastroscopies, colonoscopy and hysteroscopy are carried out and in the near future bronchoscopies are carried out. There is a pharmacy, a laboratory and ambulatory treatment rooms in the respective disciplines. Emergency interventions are provided 24 hours a day via the interdisciplinary emergency department. The Kirtipur Hospital works closely with specialized hospitals and provides an ambulance car for medically necessary transfer. The Kirtipur Hospital is committed to teaching and is currently training radiology assistants, nursing staff and laboratory staff. It will become a teaching hospital of the University of Kathmandu. Nepalmed e.V. supports Kirtipur Hospital through the organization of medical equipment and instruments and the appropriate training on these devices. Further training of the staff and the population of Kirtipur takes place. Regular advice is given on the preparation of treatment concepts and guidelines for improving the medical care in Kirtipur and the surrounding area. This is done in collegial collaboration with the staff of Kirtipur Hospital, Kathmandu Model Hospital and Kirtipur Municipality. Specifically, the endoscopy department has been fully equipped and the staff trained. After the earthquake 2015, in addition to immediate relief aid, the X-ray department has been also completely equipped with digital X-ray and 16-line computed tomography including power stabilizer and battery backup system. Nepalmed set up a training cabinet for first aid and resuscitation and organized training of the staff.